I have a weird relationship with Shoreditch. 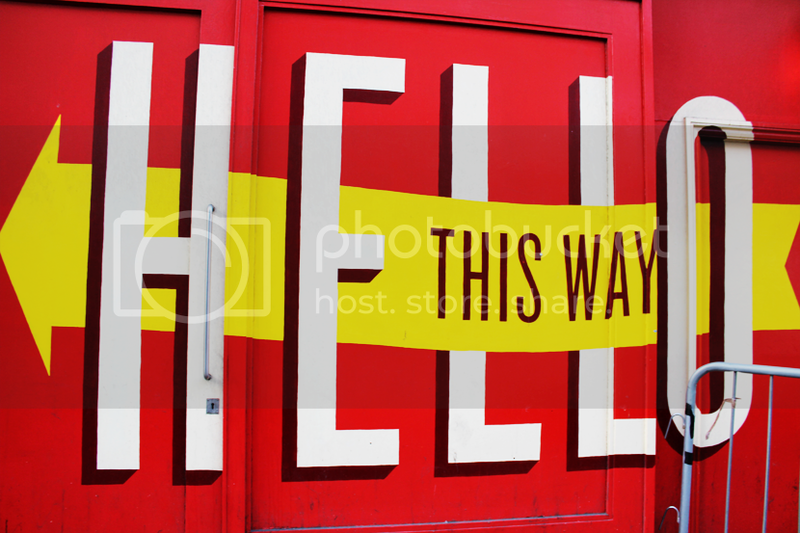 I absolutely love it in the daytime and in the early evening – it seems to be so full of life, quirky places to visit and colourful wall murals everywhere you look. However, come night time, I don’t often know what to do with myself there. Everywhere seems to be so busy, and if I haven’t really planned where to go specifically, it can be overwhelming to know how to choose the right place. Many times I have just ended up going home early as I just didn’t really know where to go. 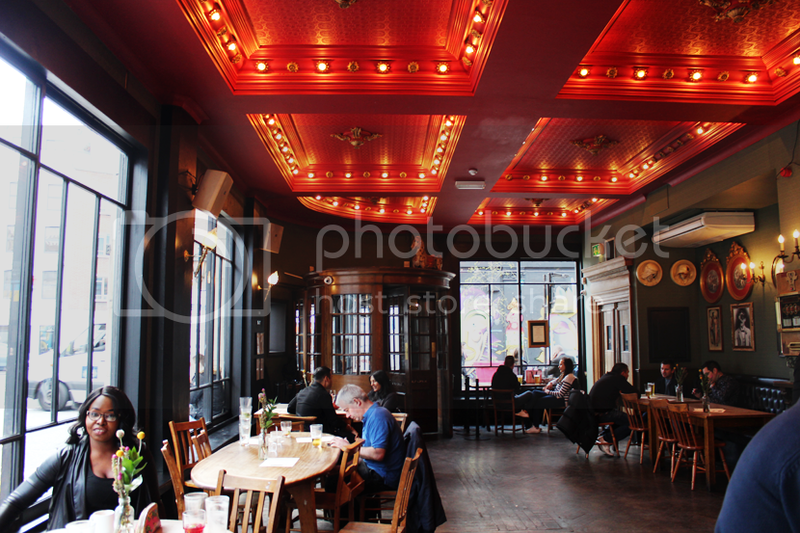 I like places where I can either dance to good music (having some space to move would be nice too..!) or somewhere where I can actually find a table, sit down and catch up with my friends without having to shout over the music (how old is this making me sound?!). If anyone has any suggestions of places like these, please let me know in the comment box! So far I’ve really liked The Bookclub (although this can get really crowded too if you go too late) and the food markets such as Boxpark (the best falafel I ever had was here) and Dinerama are fantastic too – but that’s about it so far. 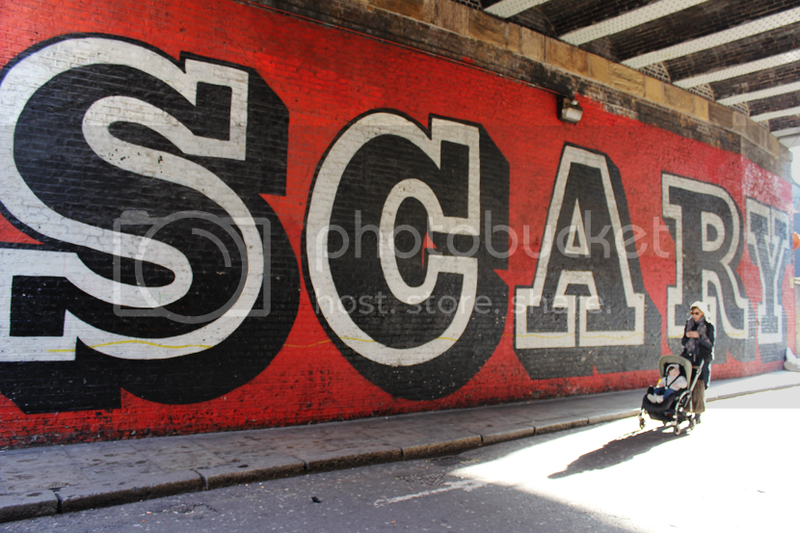 Daytime Shoreditch, however, is another matter entirely – I absolutely love it! 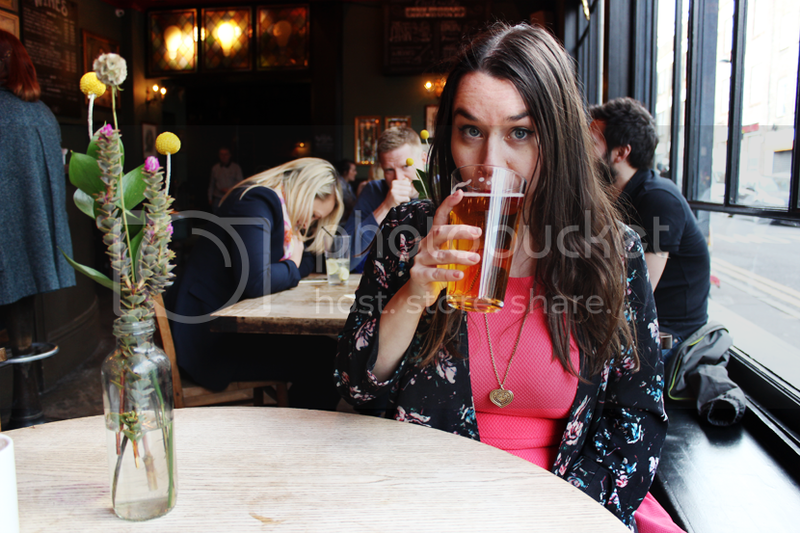 A few weeks ago me and my friend Mary went to Urban Food Fest in Shoreditch High Street and afterwards had a long stroll around the area taking pictures and just enjoying the lovely sunshine. 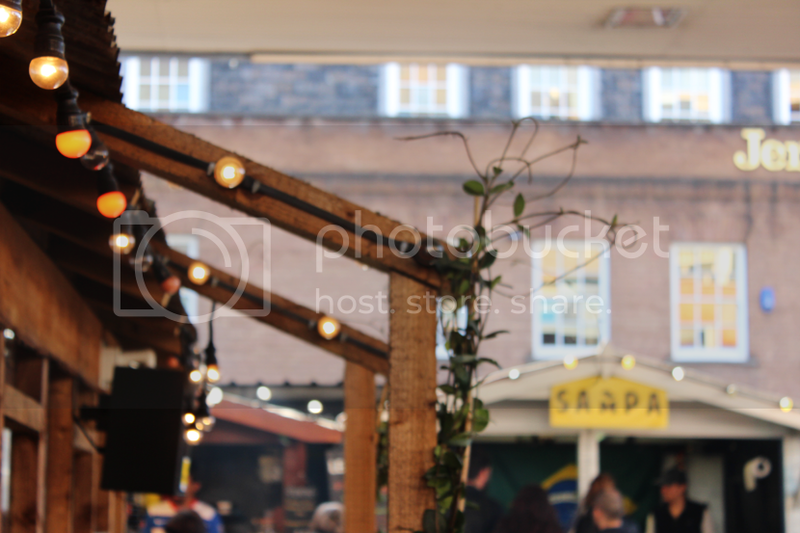 The Food Fest was really good – the last time I visited was two years ago and it’s really grown in that time and there was so much more stalls to choose from this time around. Prices are not necessarily cheap, but I’d say it’s still cheaper than going out for a proper sit down dinner, so coming here on a sunny day will absolutely be worth it as the atmosphere is really great (there was even some live music when we visited!). After finishing our lunch we decided to have a little walk around the area as it was such a beautiful day. We walked through the little back streets (I’m thinking those places I was talking about in the first paragraph could maybe be found here!) 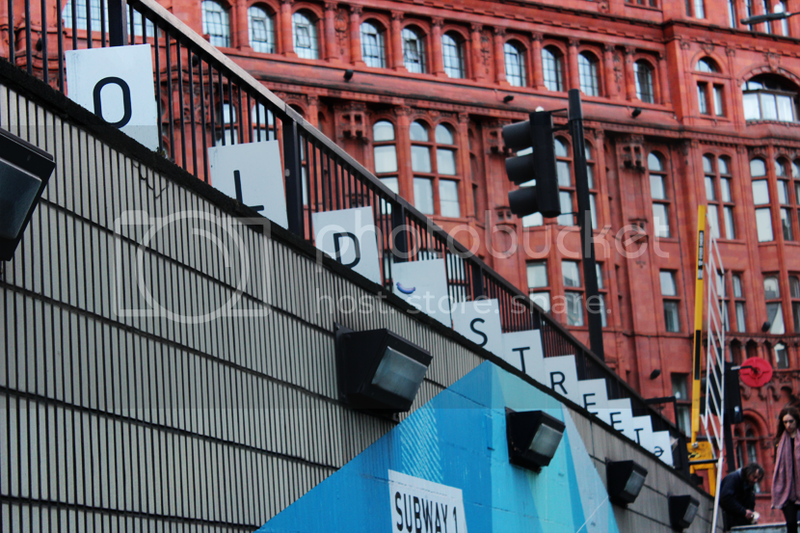 towards Old Street taking pictures and trying to find somewhere to have a drink and sit down (again..). 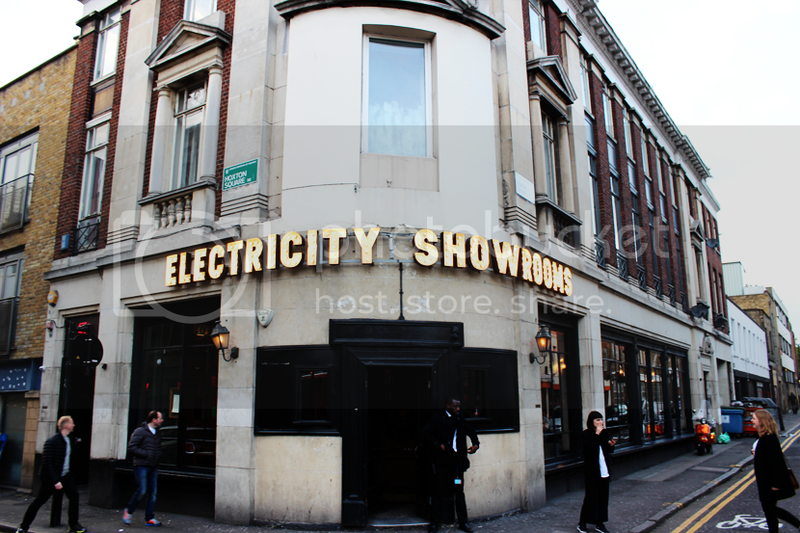 After a bit of a walk we finally ended up in a pub/bar called Electricity Showrooms on Hoxton Square. I’ve been to this place only twice so far but I absolutely love it! 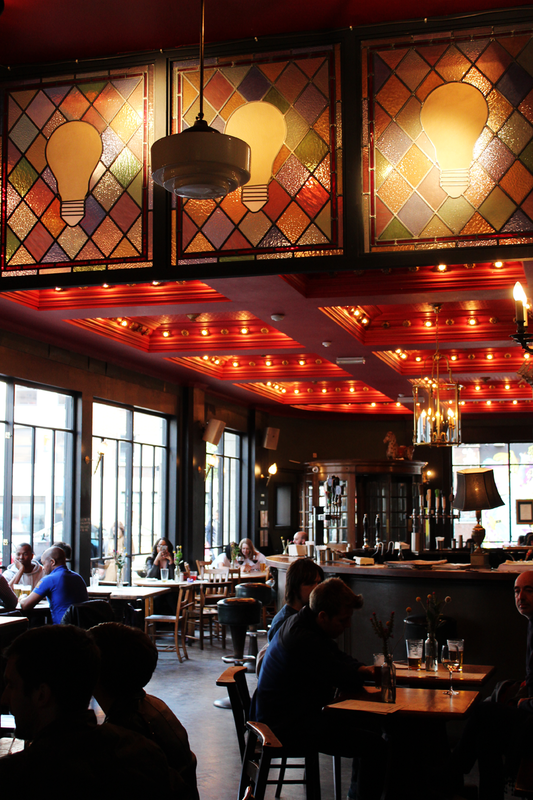 The interior kind of reminds of being in a vintage circus – it’s all red walls, colourful glass and neon signs. 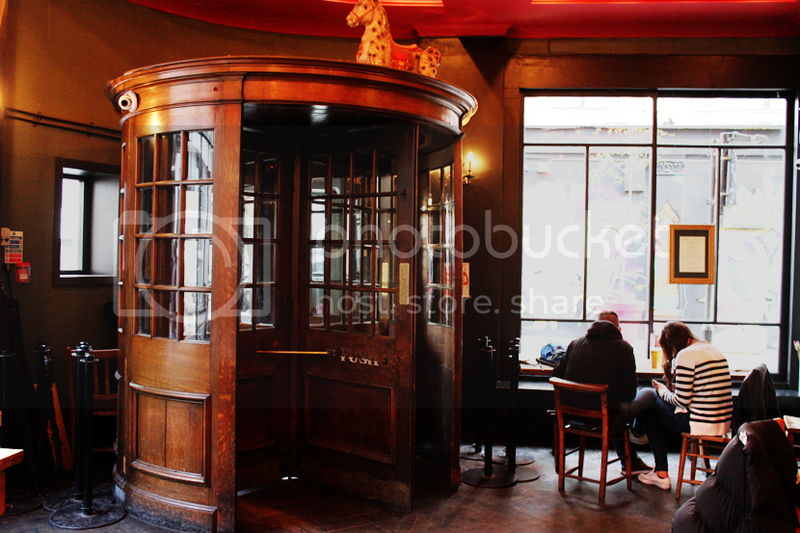 It actually also kind of reminds me of another place I love, the Wenlock and Essex in Angel – does anyone know if they’re somehow related? We only went for drinks (cider for me and hot chocolate for Mary – both very yummy! ), but for those who are interested, they also do food. 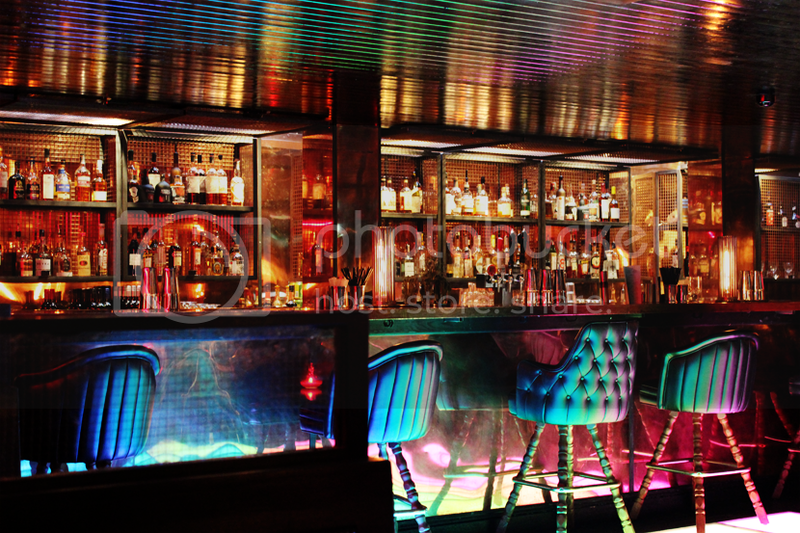 They’ve also got a downstairs bar that has a really cool multi-coloured disco floor (is that the right term?!) 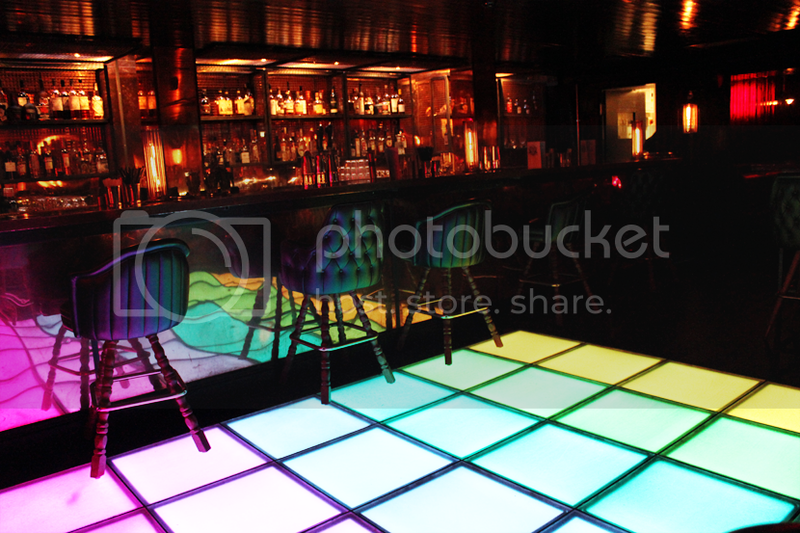 where I imagine you will be able to go dancing later in the night. I haven’t been able to find out what kind of music they play though, so if you’ve ever been here I would love it if you could enlighten me! 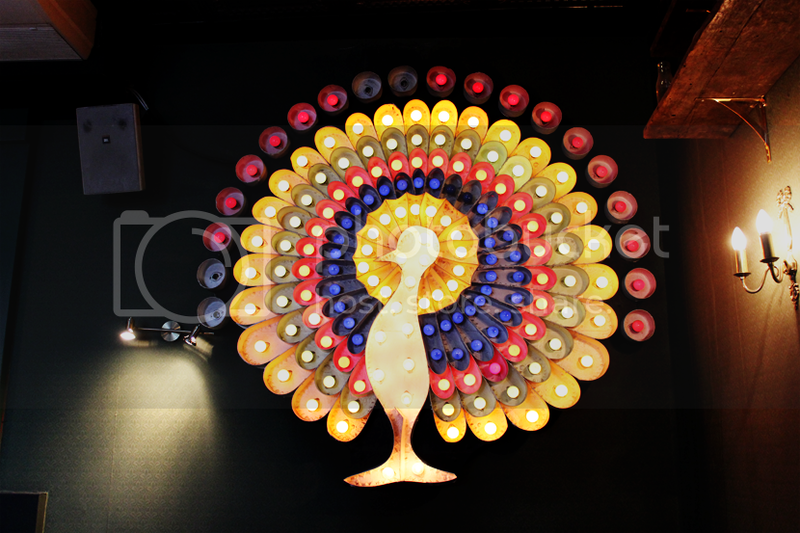 The colourfulness doesn’t stop after you leave the pub, either! 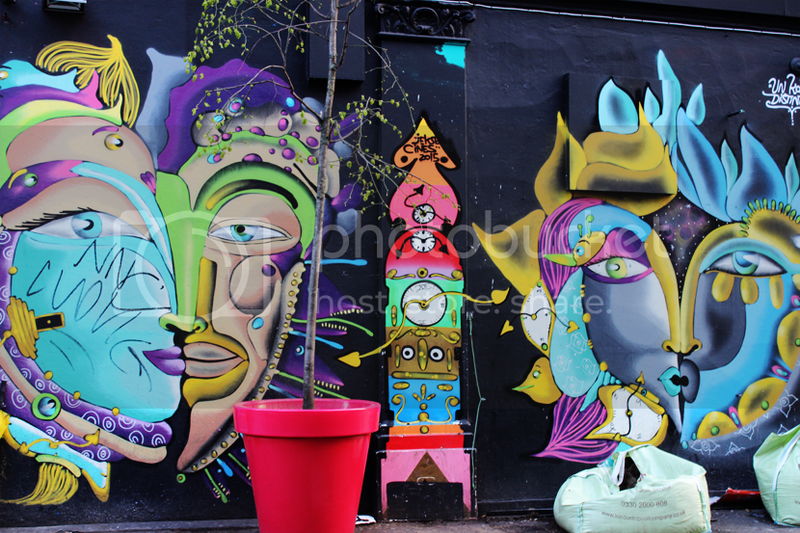 Right in front of Electricity Showrooms there is this lovely and very vibrant wall painting next to which, of course, I needed to have some pictures taken.. 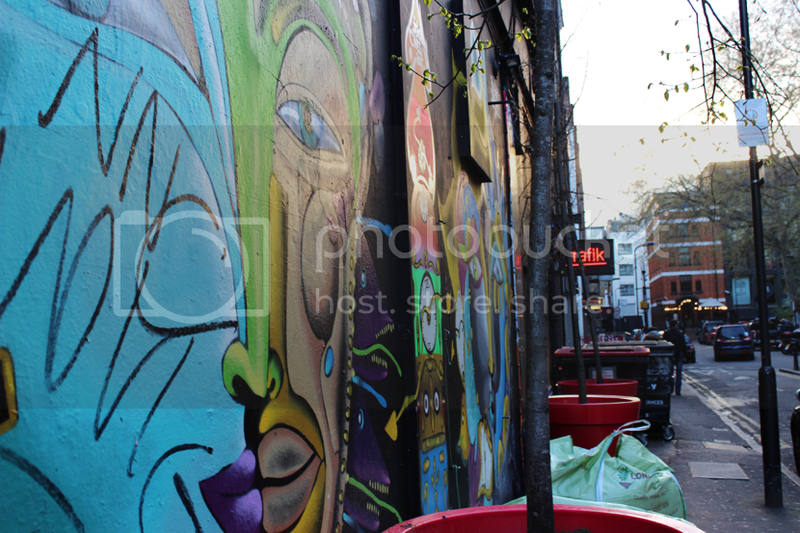 Remember what I said about loving the colourfulness of Shoreditch earlier? Things like this are exactly what I was talking about! 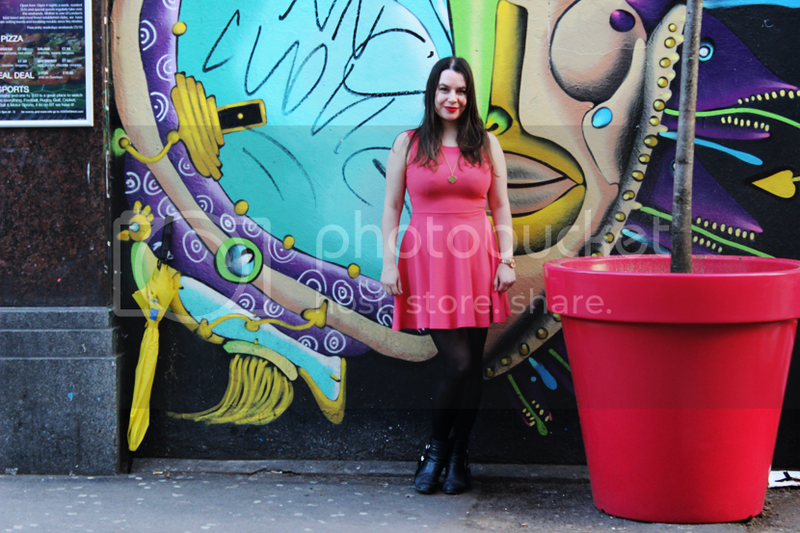 My other favourite is the big wall on Old Street, which I have also posed against (of course) – you can take a peek in my Hackney guide for more! 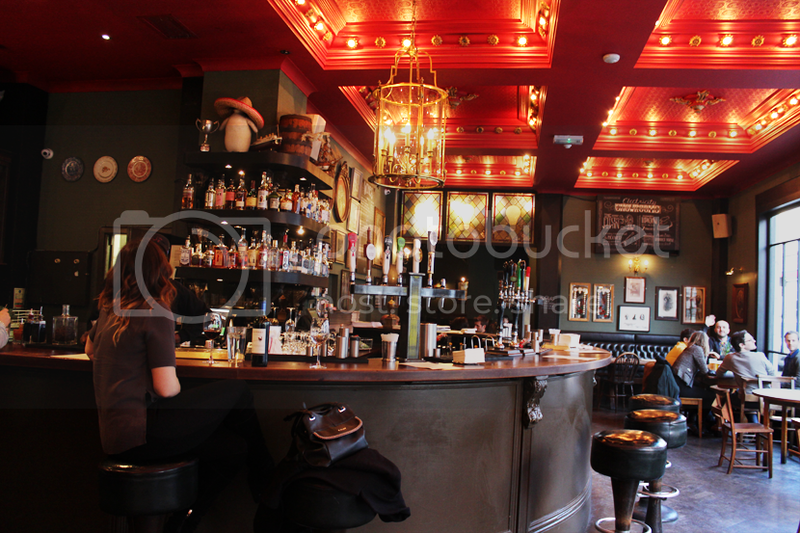 What are your favourite places in Shoreditch? 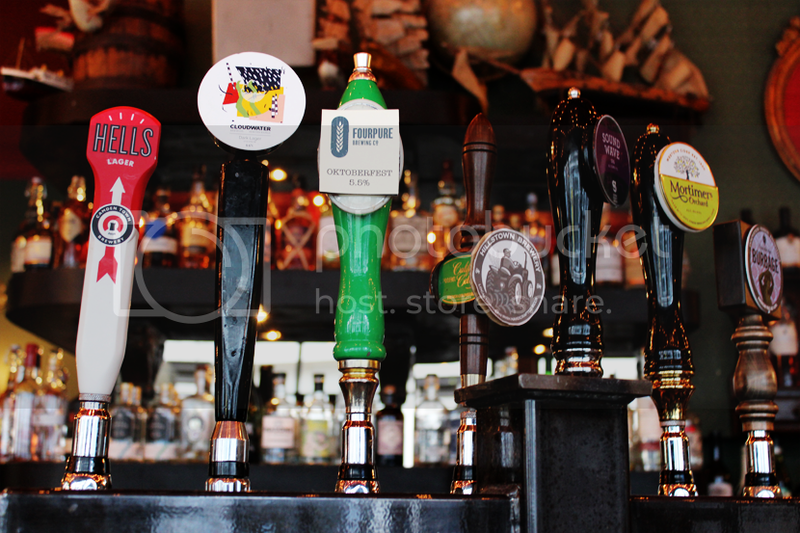 And most importantly, where do you think I could go for my quiet(-ish) but still vibrant drinks with friends?